Welcome to Snyder's Lock & Key Co.
Making life more secure for those around us for over 30 years. The security specialists for all of your security needs. N.E. Indiana's most trusted locksmith! We provide Sales - Service and Installations at your site. Surveillance Systems - Indoor and Outdoor security cameras for complete monitoring. We offer complete installation and service for all of the equipment we sell. If you are having problems with your current system give us a call, we also provide service and repairs on existing equipment. 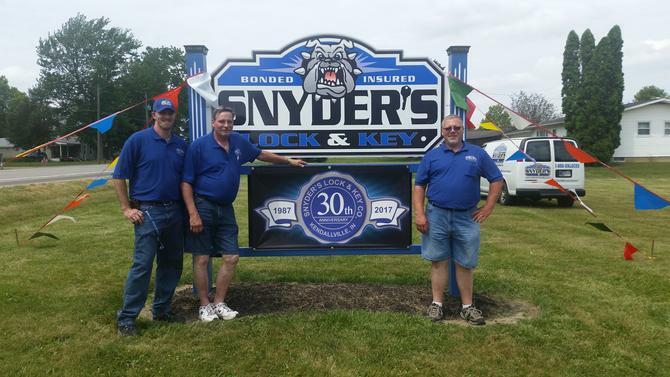 Snyder's Lock & Key Co. has the experience to do the job right. Alarm Systems - Burglar and Fire Systems - Residential, Industrial, and Commercial. All systems report directly to a 24 hour monitoring service that will alert your local police and fire departments when the alarm goes off. You will receive immediate notification when alarms occur so you can rest easier knowing your property is being monitored when you are away. We are the security specialists who can provide the protection you need to rest easy. Whether you need your current locks re-keyed, replaced or updated Snyder's Lock & Key Co. will work with you and your budget to get the job done. Experienced with the old and the new, repairing and replacing as your needs change. We provide full service lock repair and maintenance for your home or business. We are Certified locksmiths, bonded and insured. Providing professional skills with the personal service you are looking for. Unlocking and securing houses, factories and businesses for over 30 years. 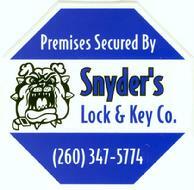 You can count on Snyder's Lock & Key to do the job right. Call us at: 260-347-5774 or send email to: dave@snyderslockandkey.com for further information. We're here to work with you.